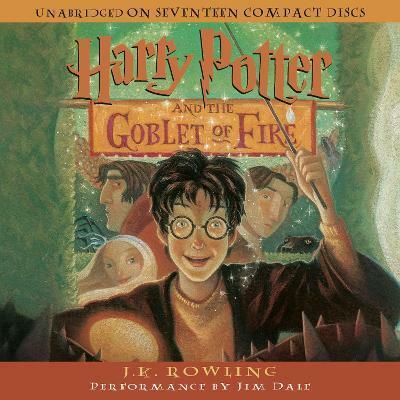 Read by Jim Dale Running time: 20 hrs., 30 mins. 17 CDs. Harry Potter returns to Hogwarts for his fourth year of magical adventures in Harry Potter and the Goblet of Fire. This year Harry turns 14 and becomes interested in girls -- one in particular. And with Dark Magic comes danger, as someone close to Harry dies. You'll have to listen to learn more! The audio is available on July 8th. Harry Potter returns to Hogwarts for his fourth year of magical adventures in Harry Potter and the Goblet of Fire. This year Harry turns 14 and becomes interested in girls -- one in particular. And with Dark Magic comes danger, as someone close to Harry dies. You'll have to listen to learn more! The audio is available on July 8th. J.K. Rowling was a struggling single mother when she wrote the beginning of Harry Potter and the Sorcerer's Stone, on scraps of paper at a local cafe. But her efforts soon paid off, as she received an unprecedented award from the Scottish Arts Council enabling her to finish the book. Since then, the debut novel has become an international phenomenon, garnering rave reviews and major awards, including the British Book Awards Chidren's Book of the Year and the Smarties Prize. Ms. Rowling lives in Edinburgh with her daughter. Performer Bio: The New York Times hailed Jim Dale as "The Toast of Broadway" in his title role in the musical Barnum. He has a long list of credits on the stage and in film and was nominated for an Oscar for writing the lyrics for Georgy Girl.